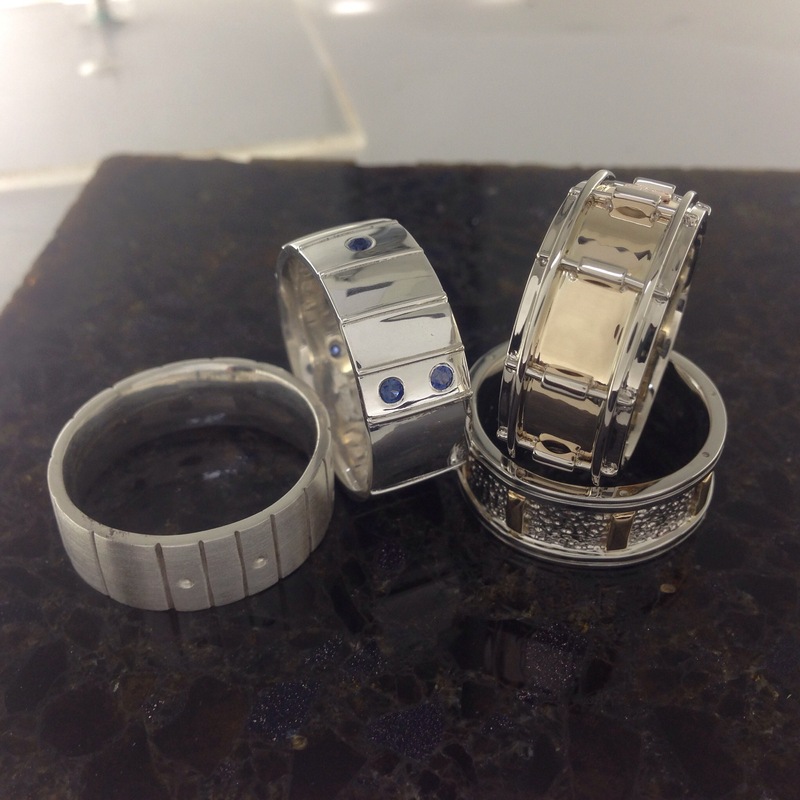 I was just going to refinish and rhodium plate the three rings. 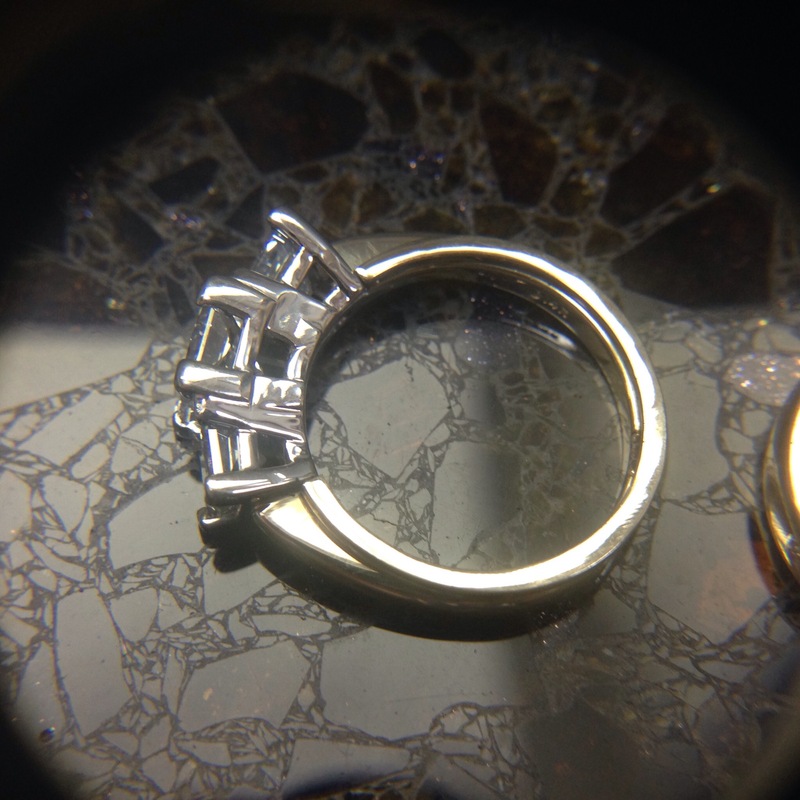 I suggested that I solder them all together. 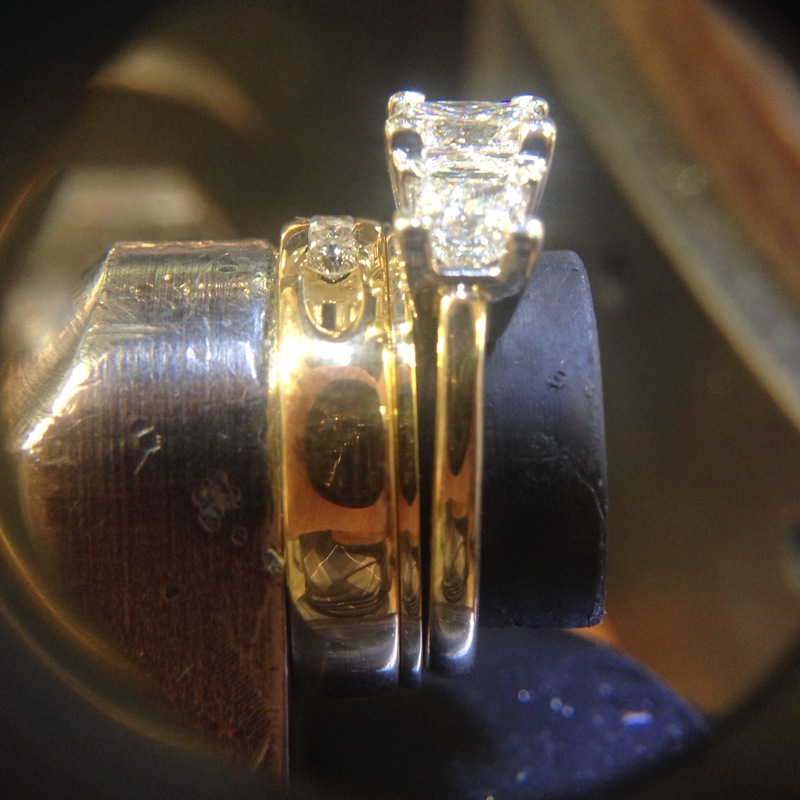 I noticed that the thin band would be perfect to act as spacer/shim to fill the gap created by the base of heads holding the princess cut diamonds. 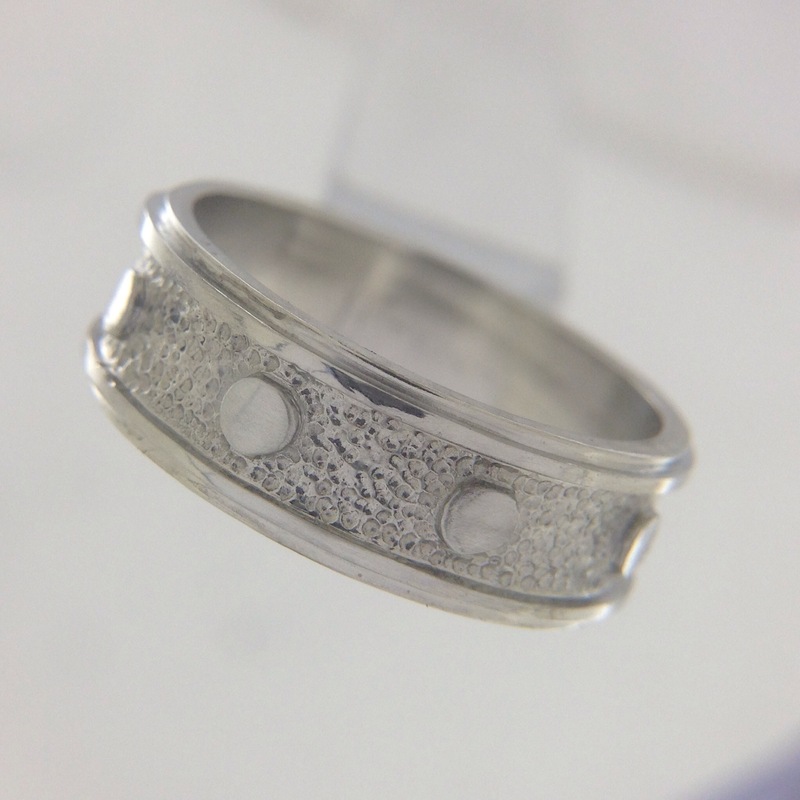 The marked area was cut out to create a flat surface for the diamond band to fit flush. 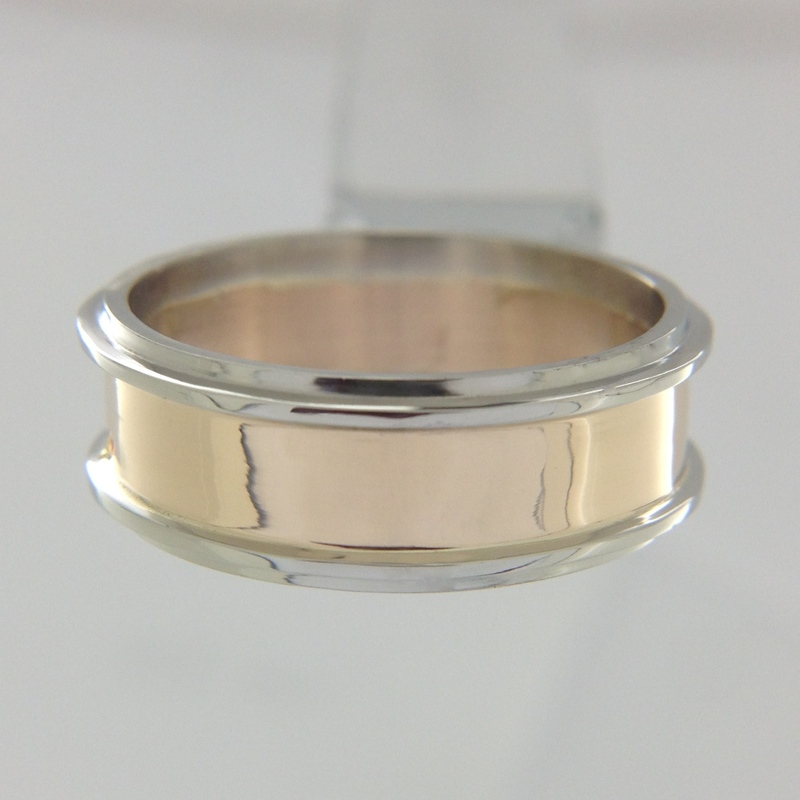 Here is the cut band fit into place, soldered and polished. 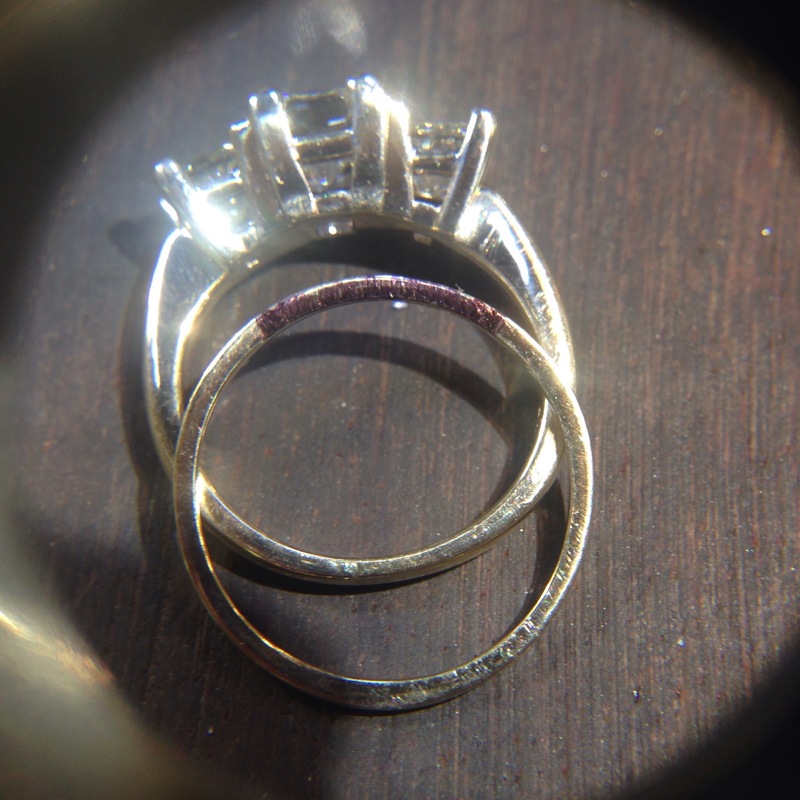 The beauty of this wedding set is the history of the parts but I didn’t learn of all the history and meaning and story behind these rings until after I completed the work. 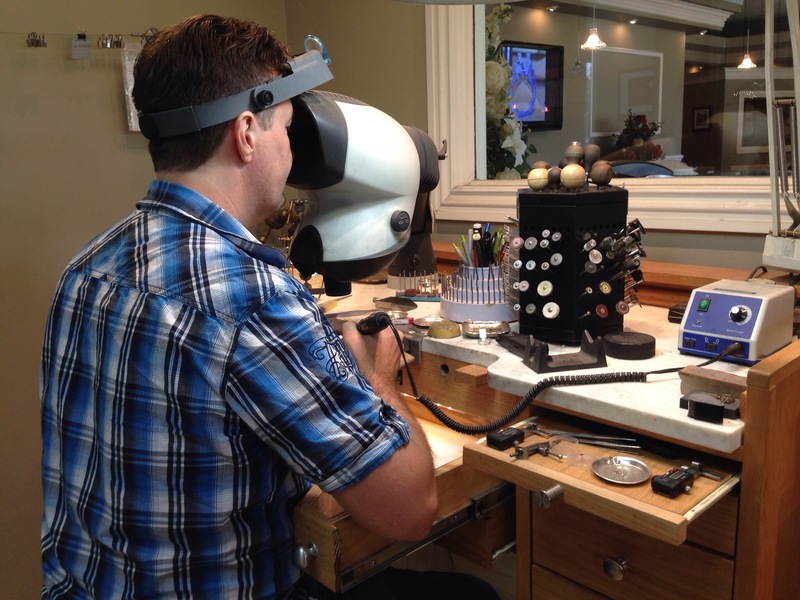 “…We upgraded to the larger center stone (when we could afford a bigger and nicer set than my original one). 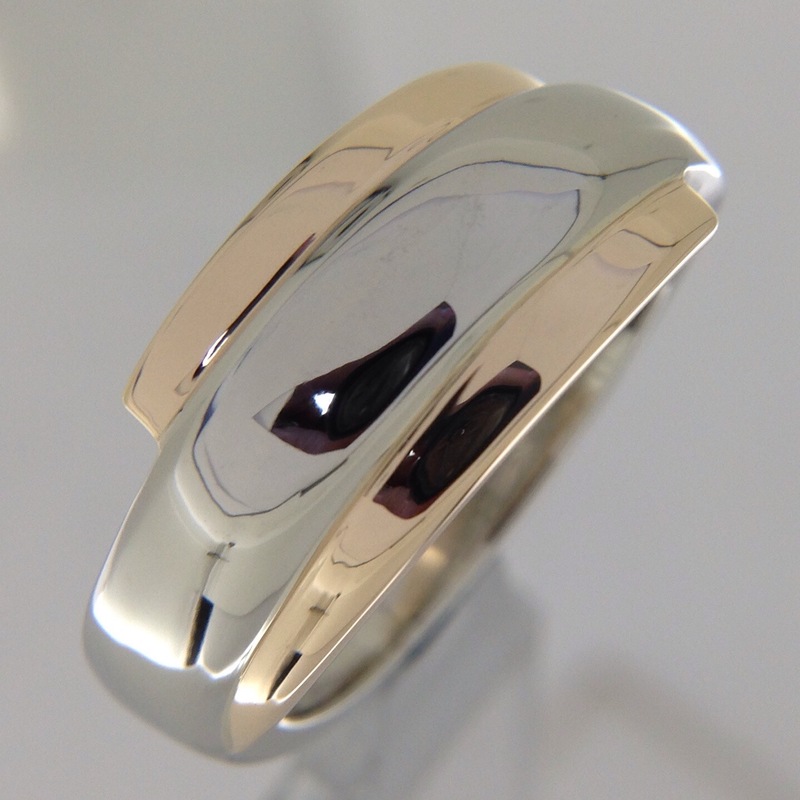 I kept the band from that set and I wore it with the the solitare for quite a few years. 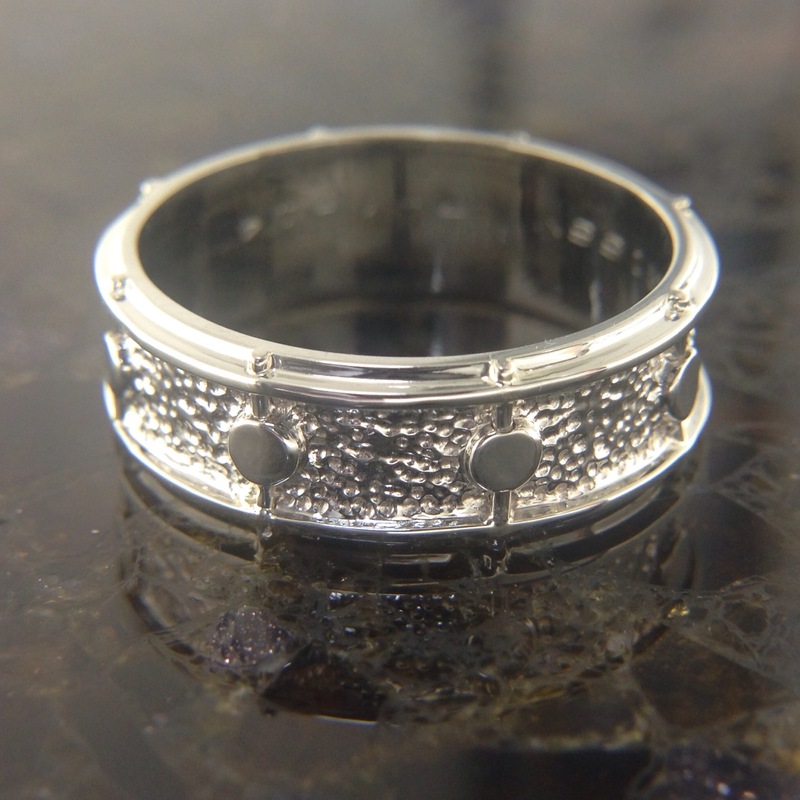 When our first son passed away, hubby bought me one of the smaller stones in honor/remebrance of our little one we lost, and to remind me that I was as strong, unbreakable and beautiful as what the diamond represented. Once Peyton was born he bought me another stone in honor of him! 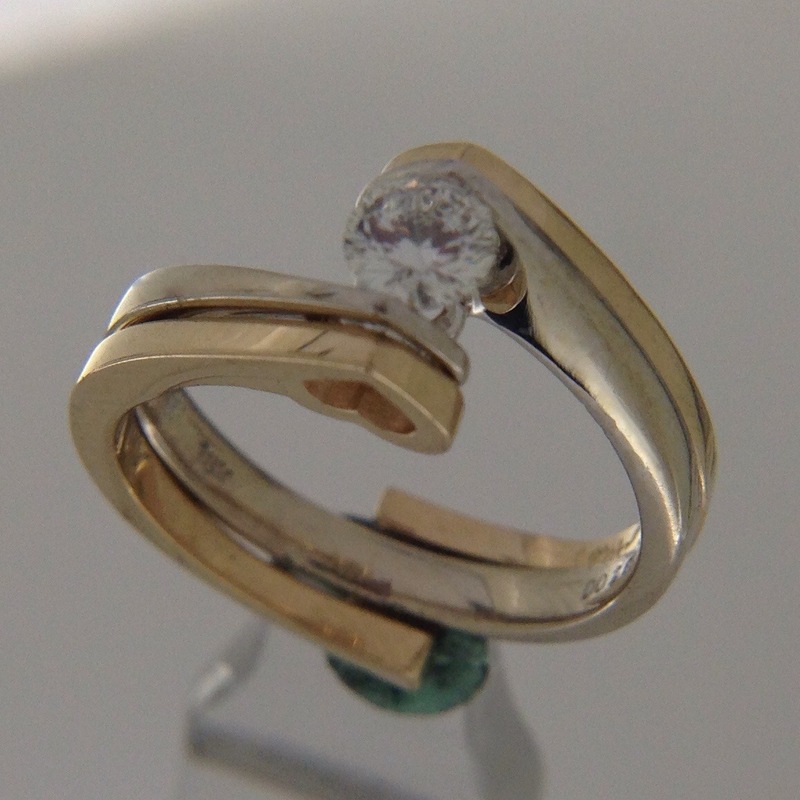 On our 10th anniversary we had the three diamonds all set into one ring. 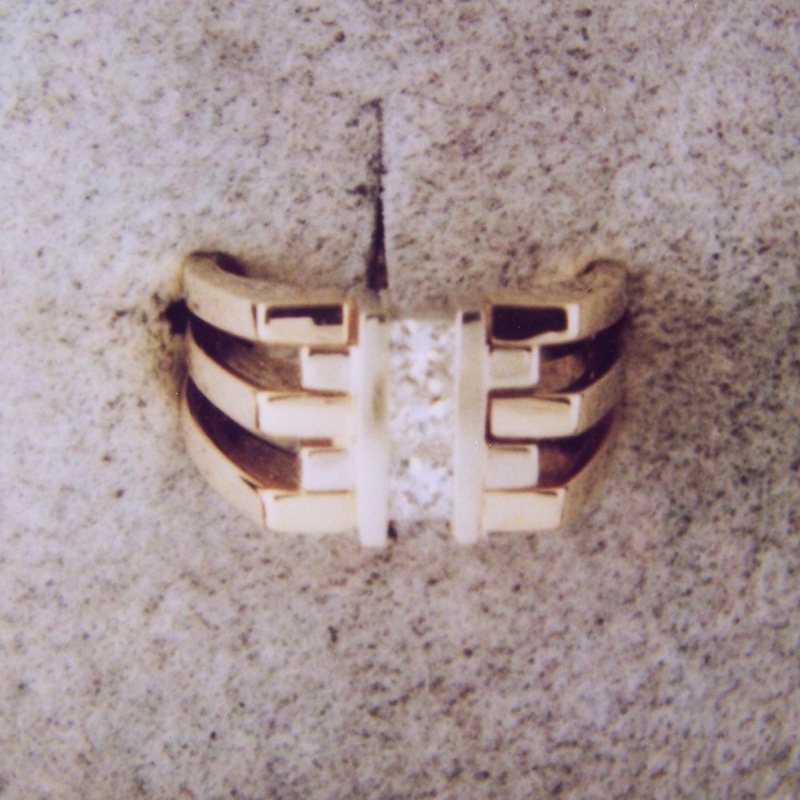 It symbolizes the family bond. 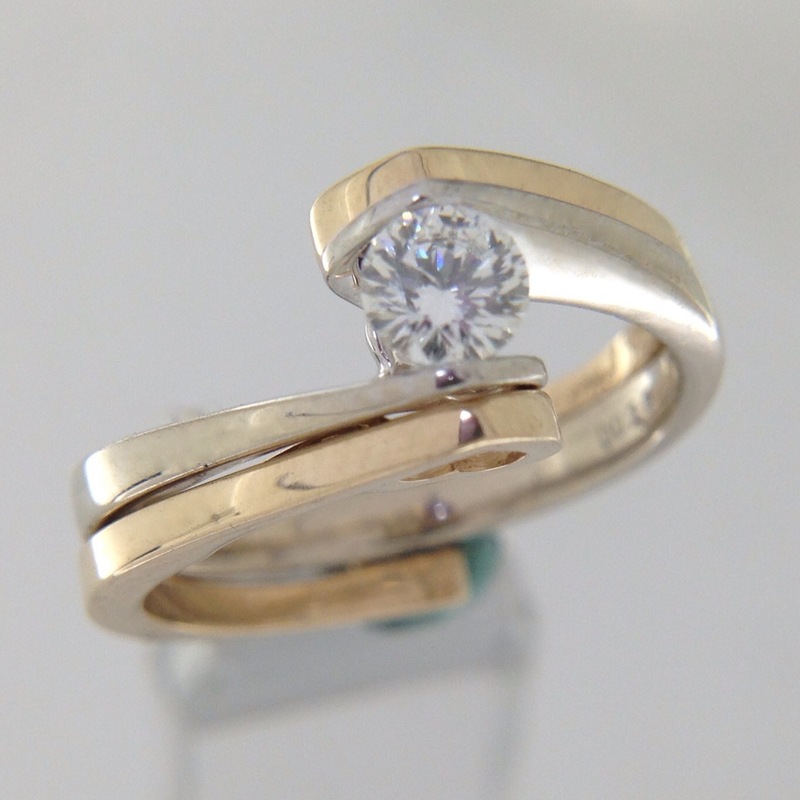 Like the age rings of a growing tree, this wedding set shows the triumphs and tribulations of what life brings walking hand in hand with the ones you love. 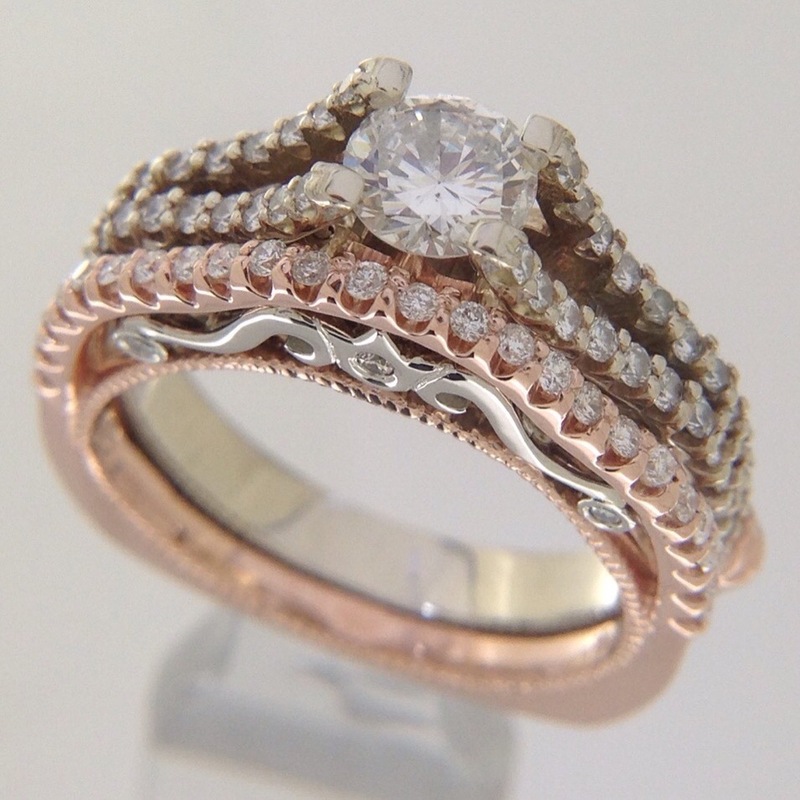 We made a rose gold wedding band to match the white gold engagement ring. I had done a post on the band. I did not post pictures of the set together. 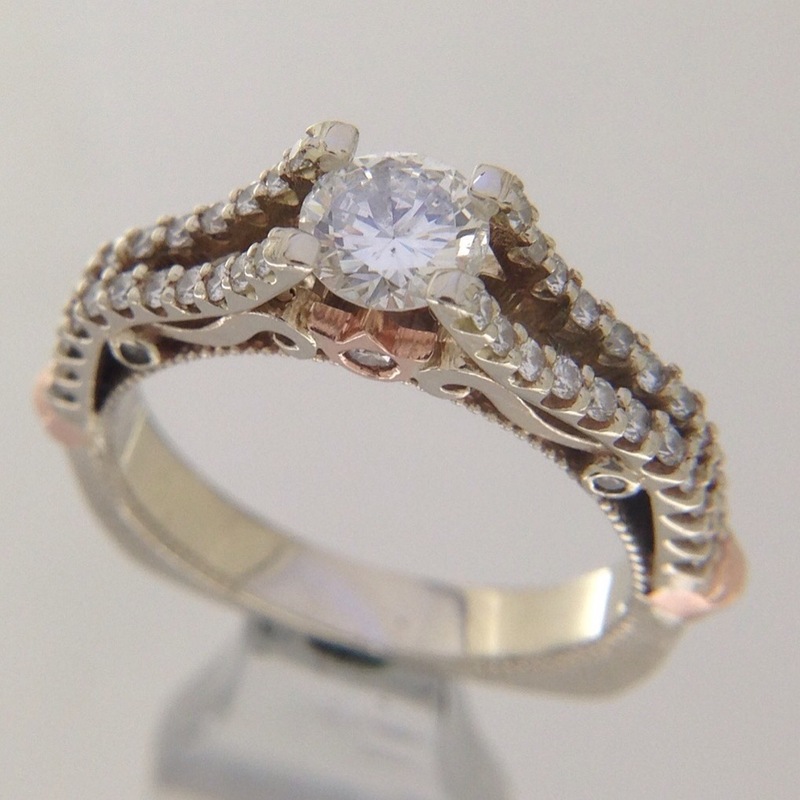 I love being asked to find solutions for a wedding set. 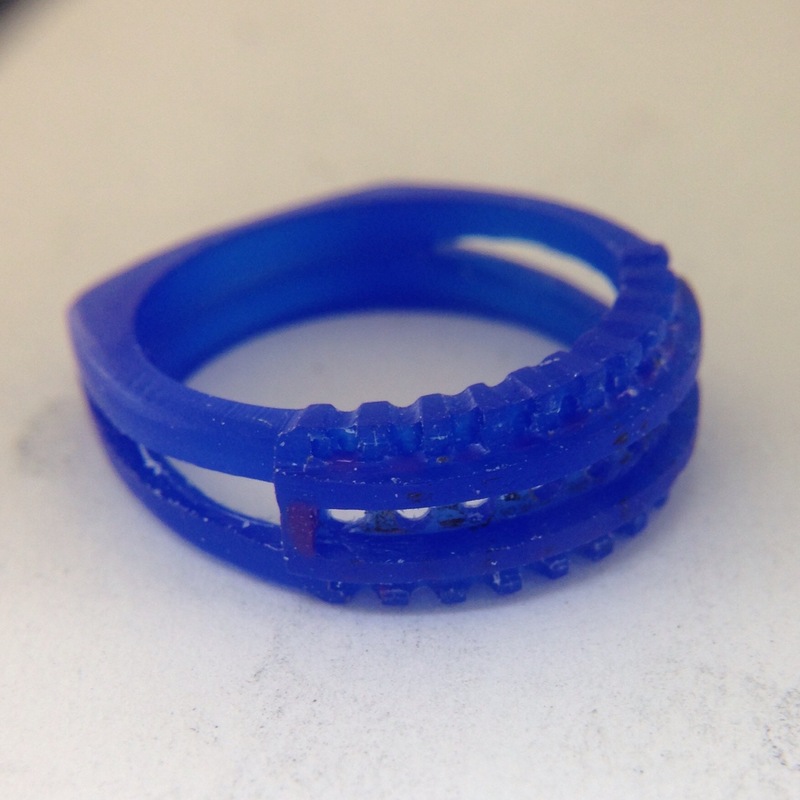 For hers, she wanted a bypass design. 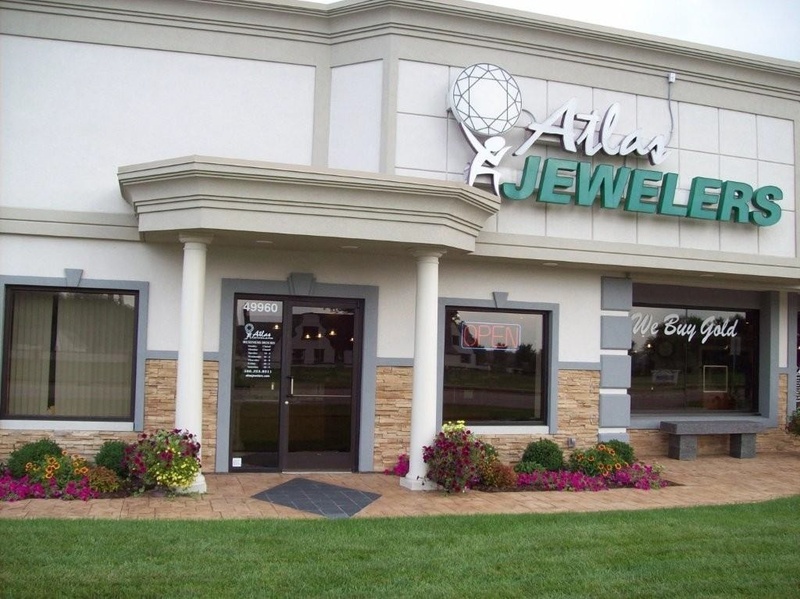 So the design was quite obvious. I matched the heart motif and kept a similar width and profile. I cast it in two pieces so I could better finish the inside of the bypass. 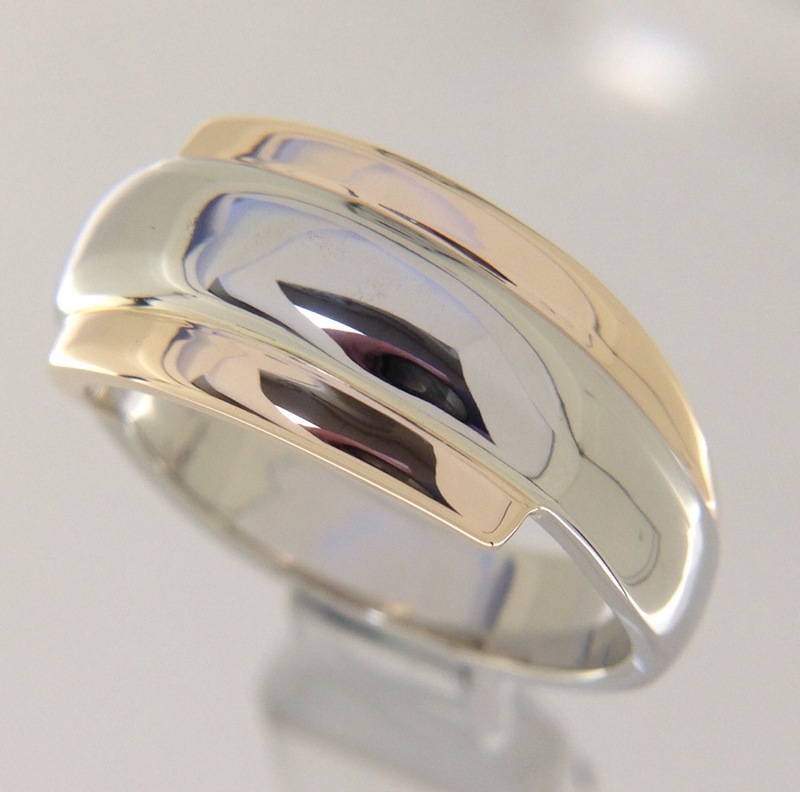 It is nice to see yellow gold making a come back. 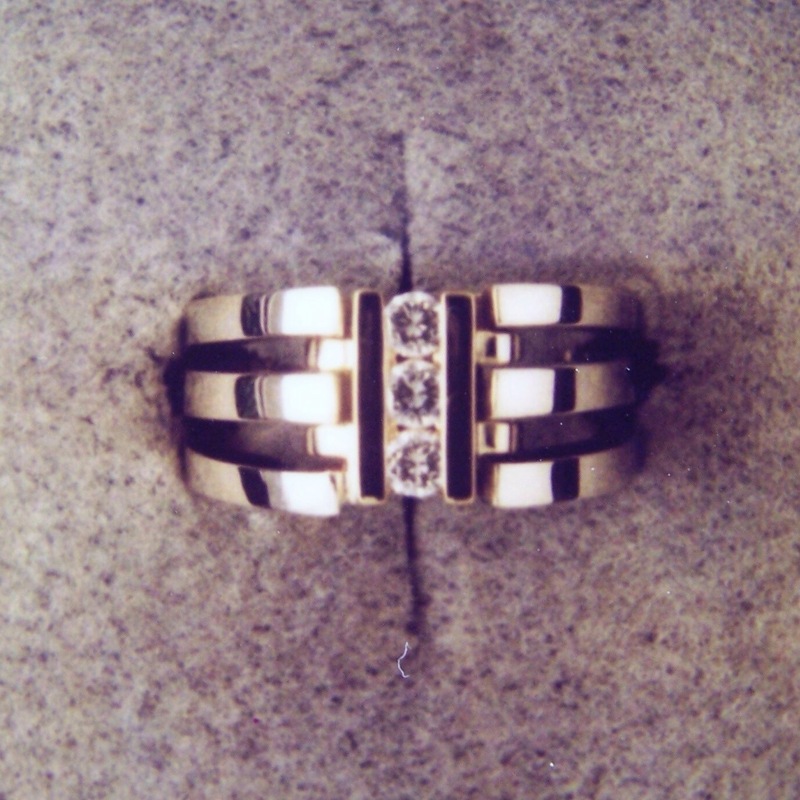 Even with wanting to keep a similar bypass look, his ring had many possible design variations. 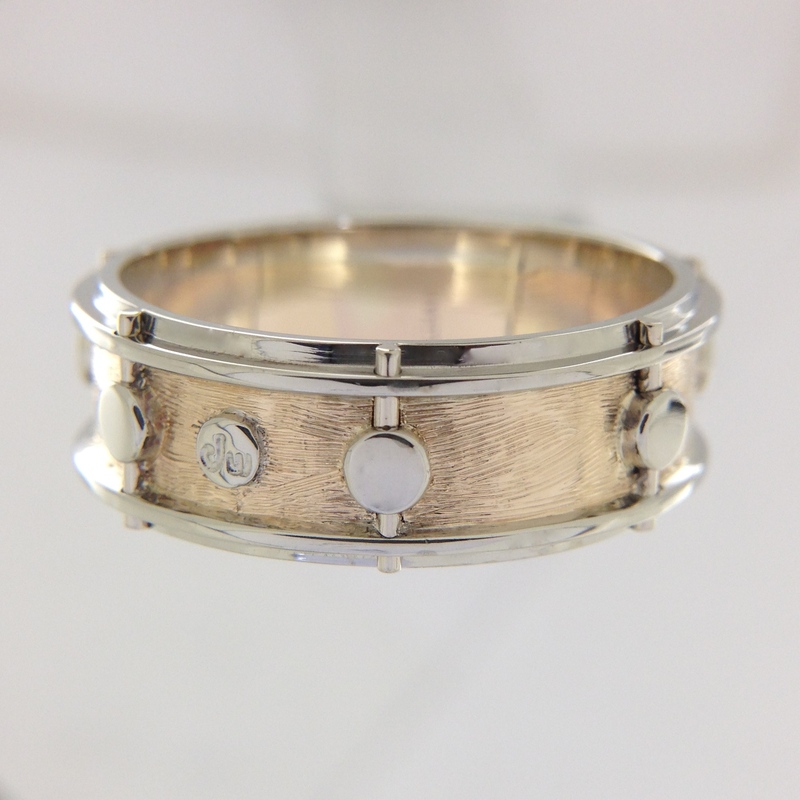 He chose the center to be a half round band. 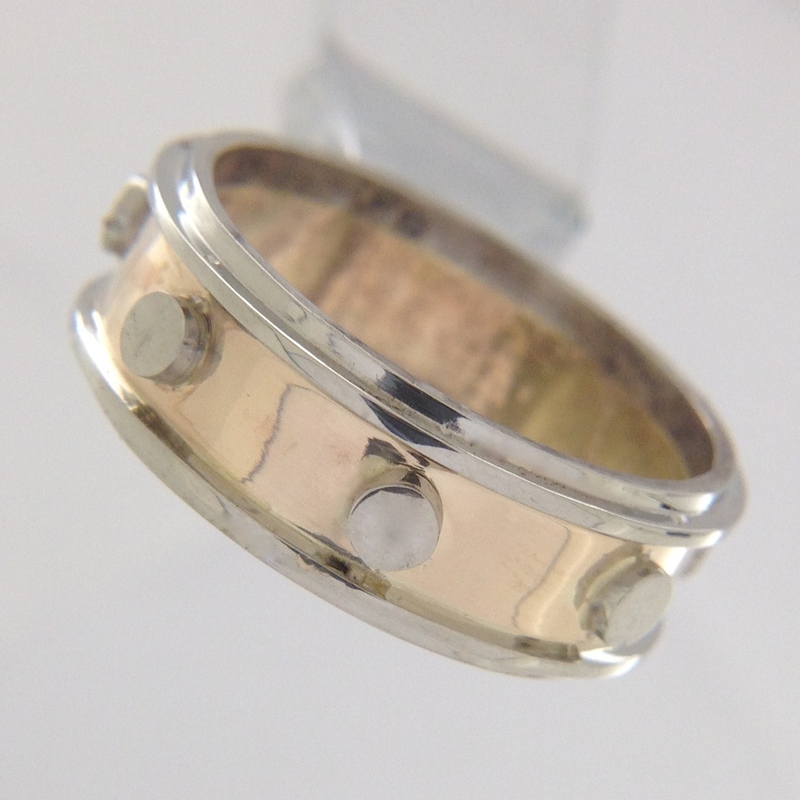 I used tungsten burnished to work harden the ring. 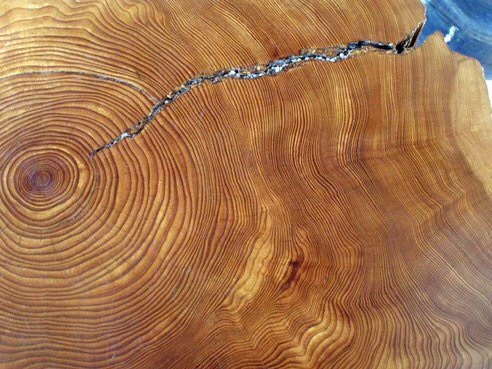 It hardens the surface and makes to more scratch resistant. 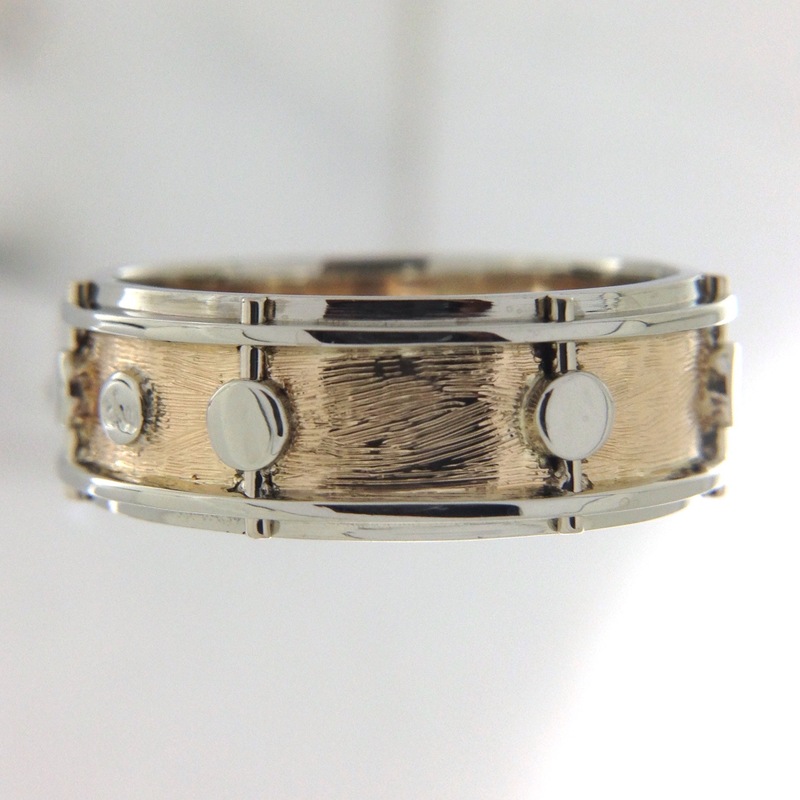 You can check my whole website dedicated to drum and guitar rings. 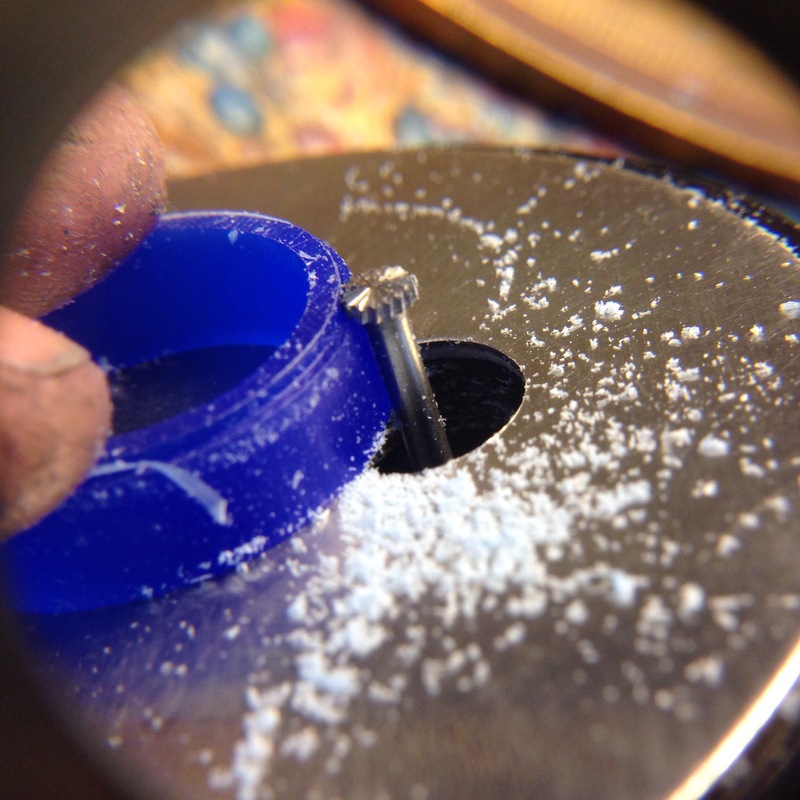 I use a Wolf Wax attachment to turn a #35 foredom hand piece into a mini router. 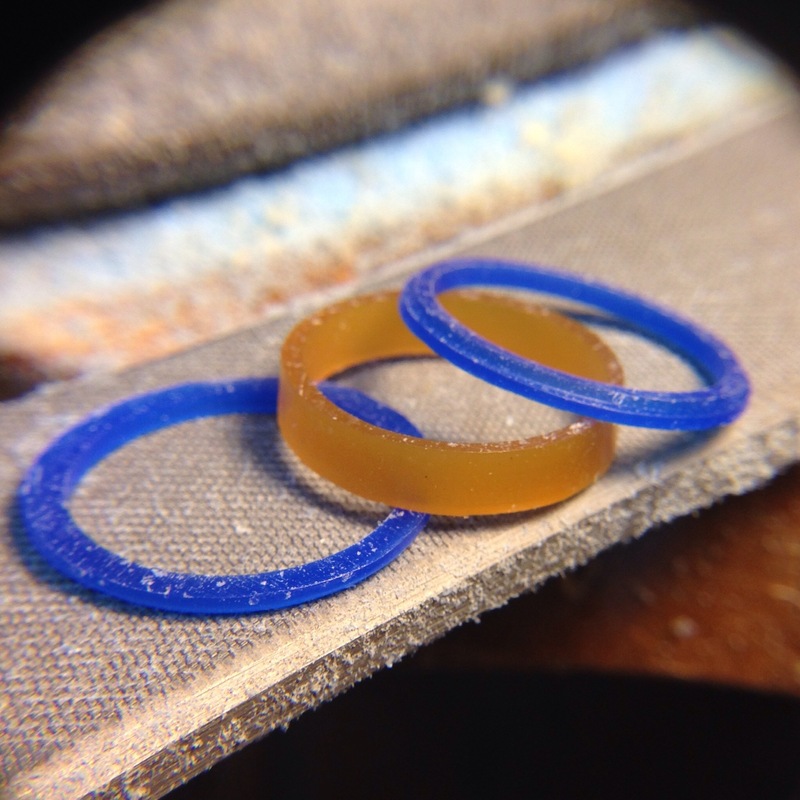 I first ream out the tube to the desired finger size and then shape the wax to a plain basic band. 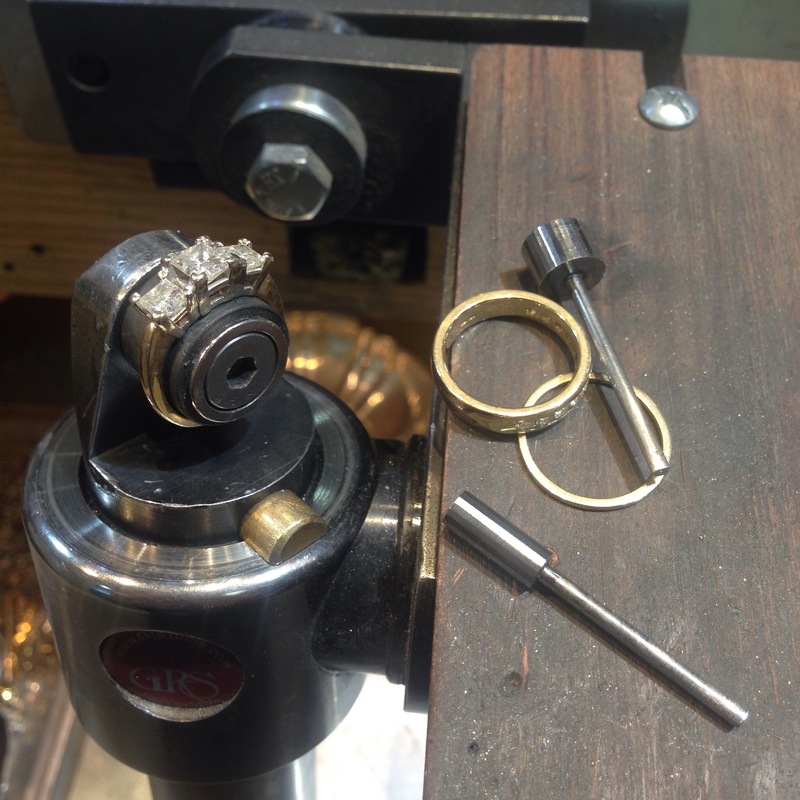 By changing the large cylinder bur to a wheel bur, I milled the step of the “rim” of the hoop. I Flipped the wax over and repeat the cut. I marked out 8 equal lines for the placement of the lugs and tension rods. 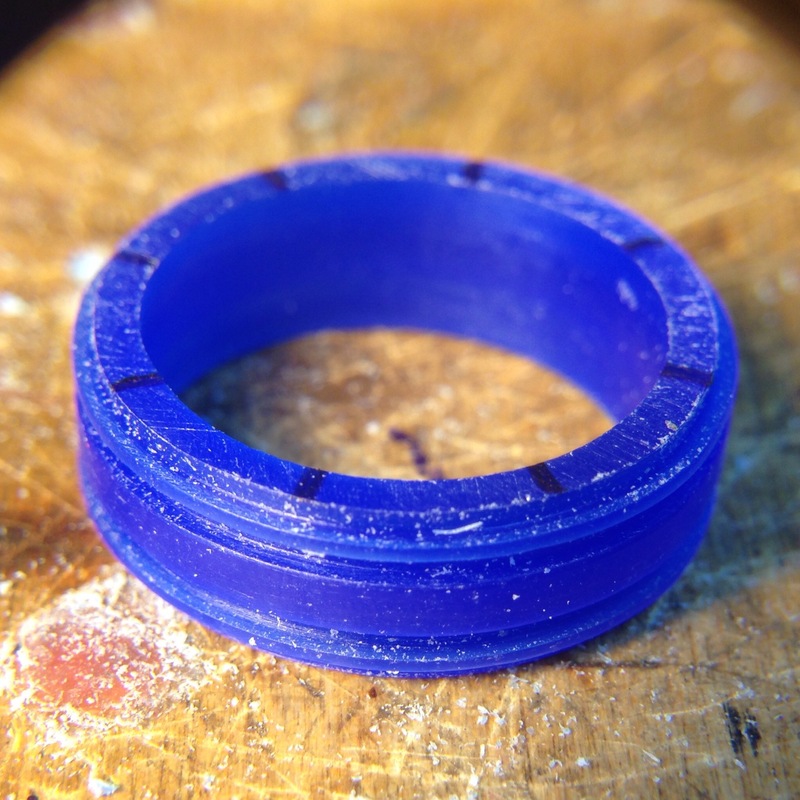 Here is the finished wax after texturing the shell with a 1.0 mm ball bur for the finish the customer custom ordered. 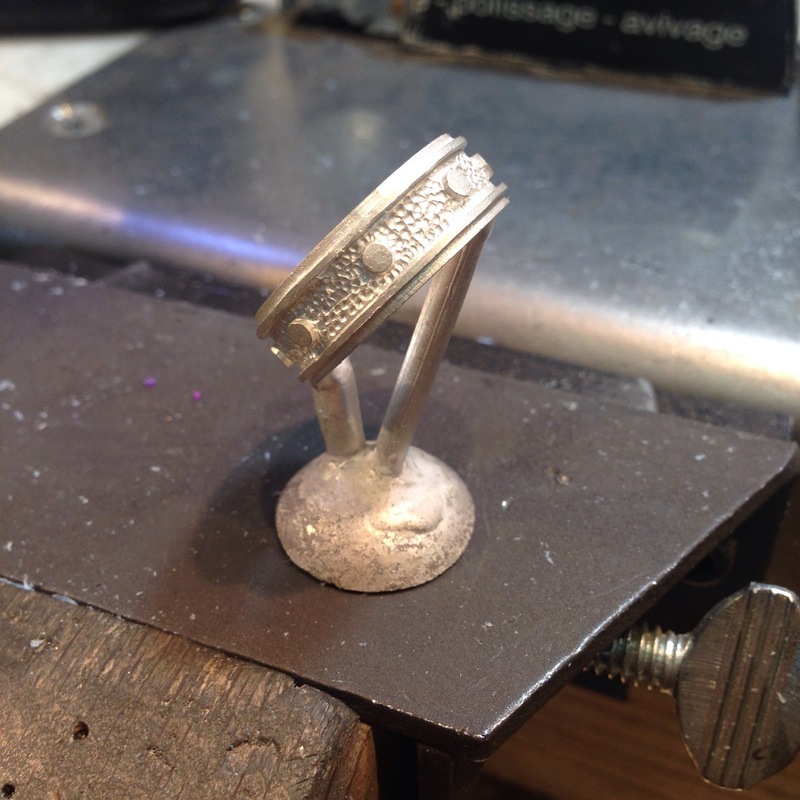 The wax model is sprewed on to a rubber base and a metal cylinder is placed over that. A special plaster is poured into the flask. 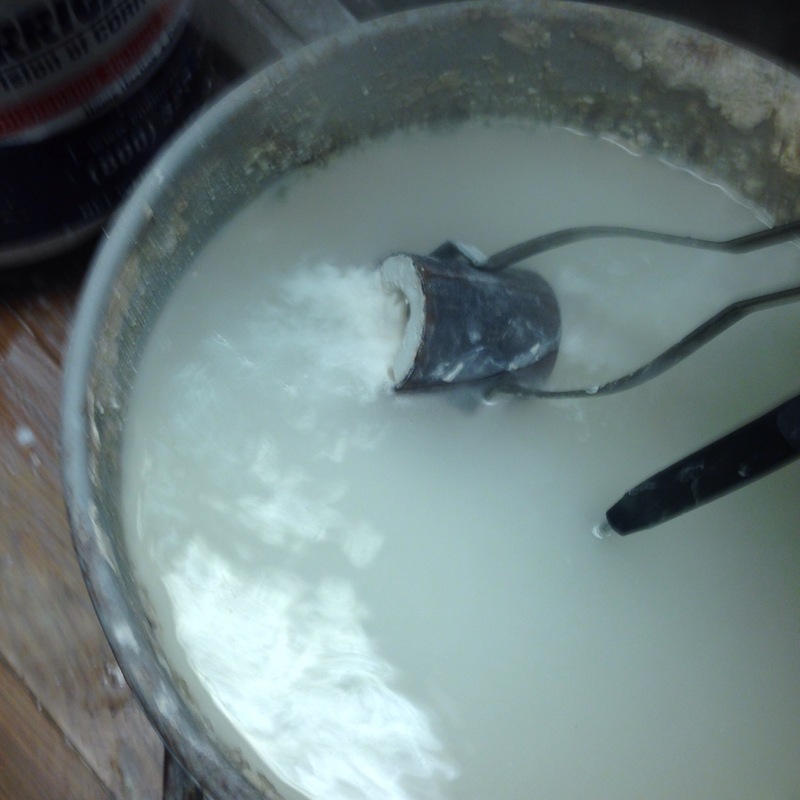 When the plaster hardens the rubber base is removed, exposing the ends of the wax sprew. The flask is placed in a kiln. 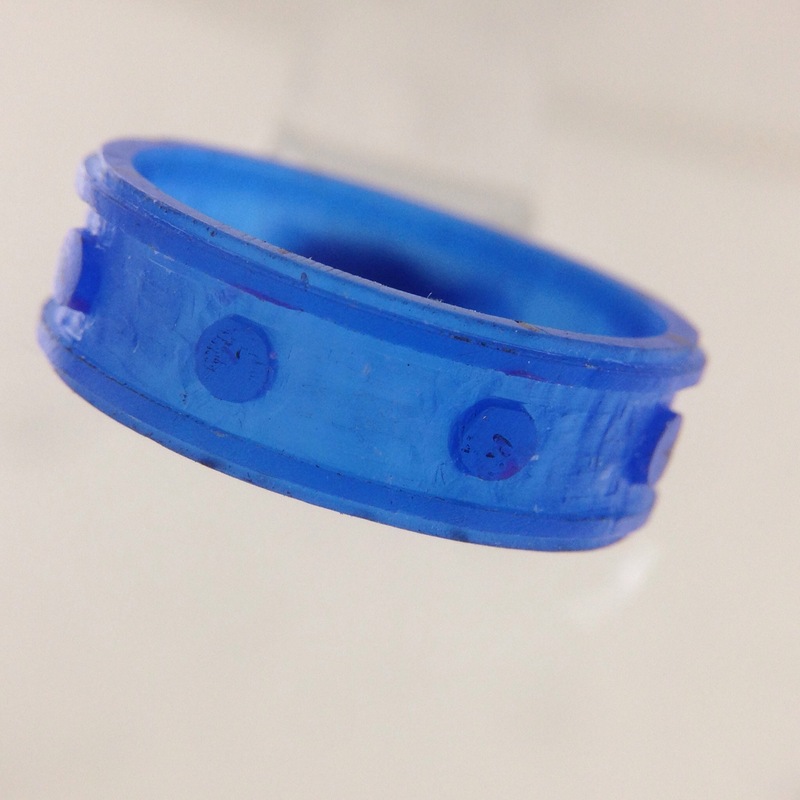 As the temperature rises, the wax melts out, leaving a cavity of exactly what was carved. 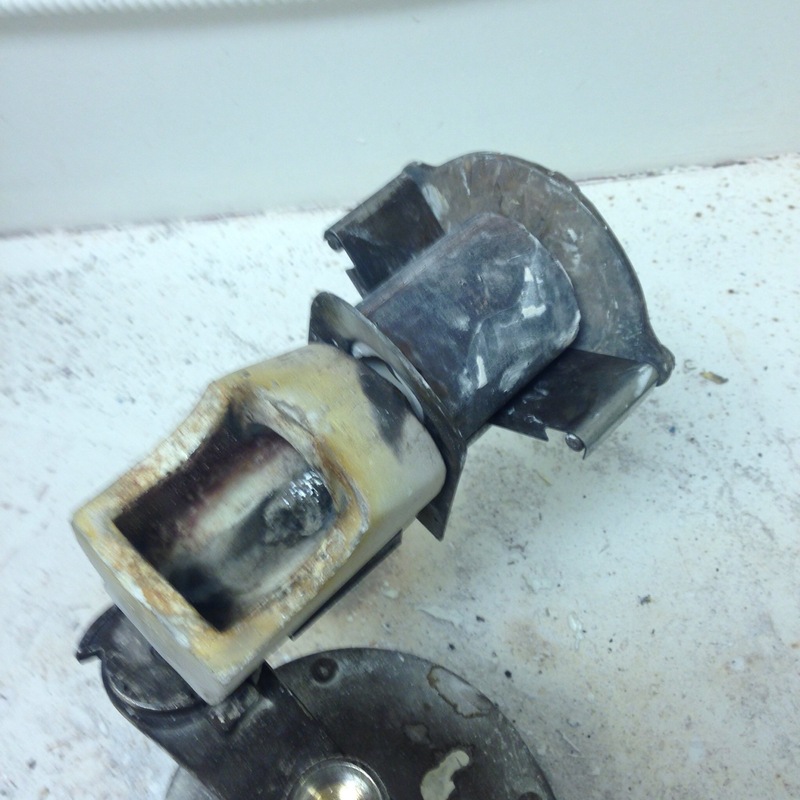 The molten metal is “shot” into the flask with the aid of a centrifuge. 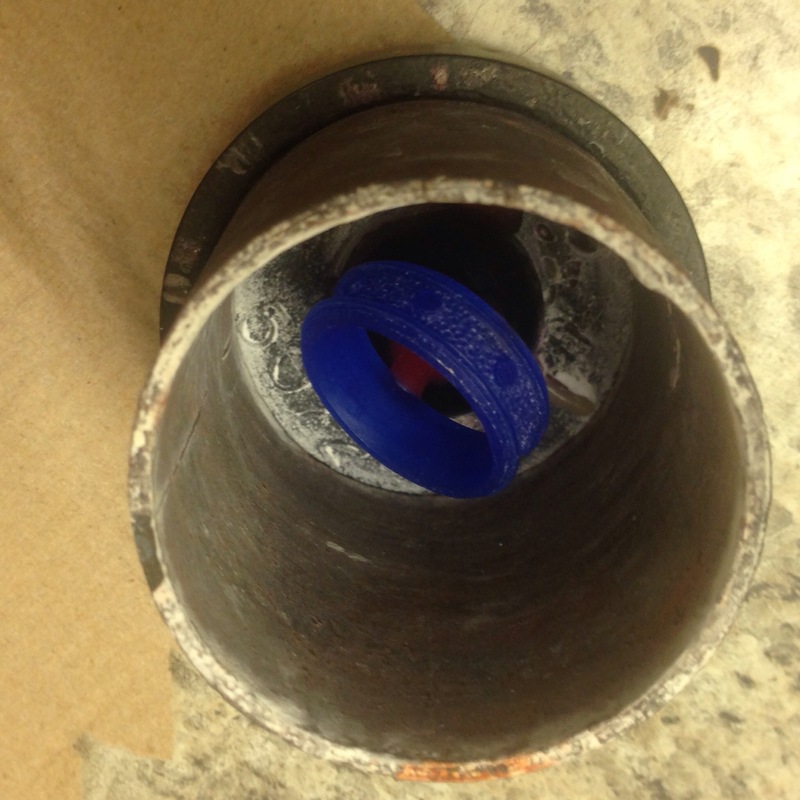 Here is a flask just after casting. 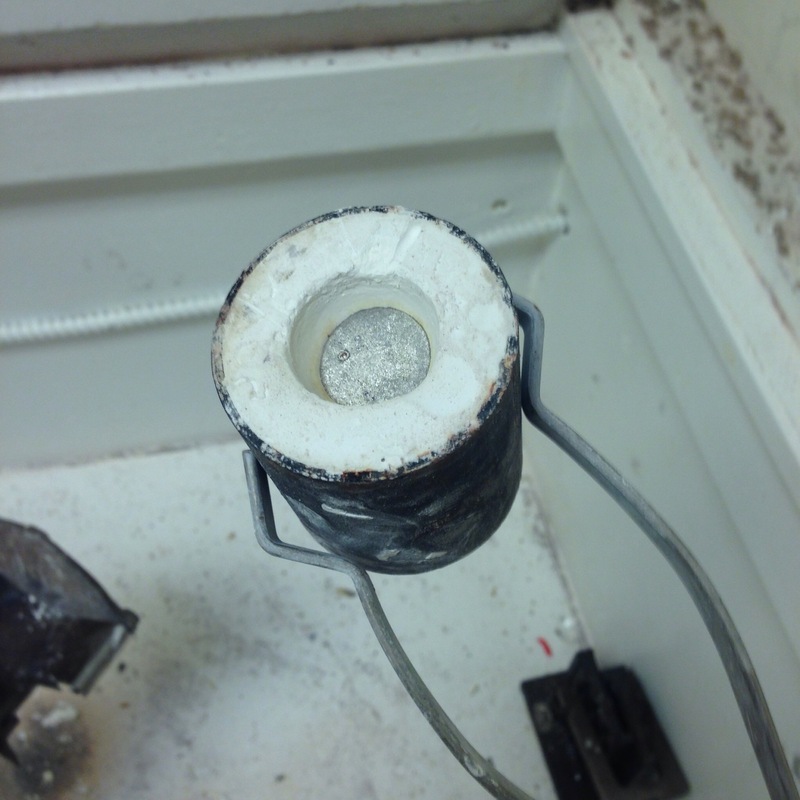 When you dunk the mold in water, the plaster breaks down. 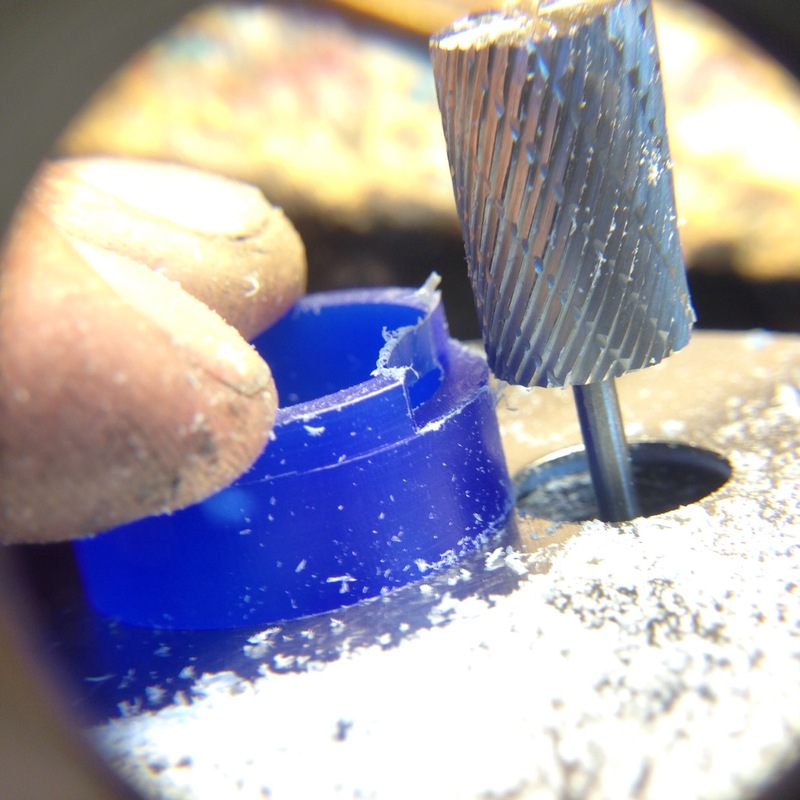 The ring is cut off of the button and goes through a process of sanding and polishing. 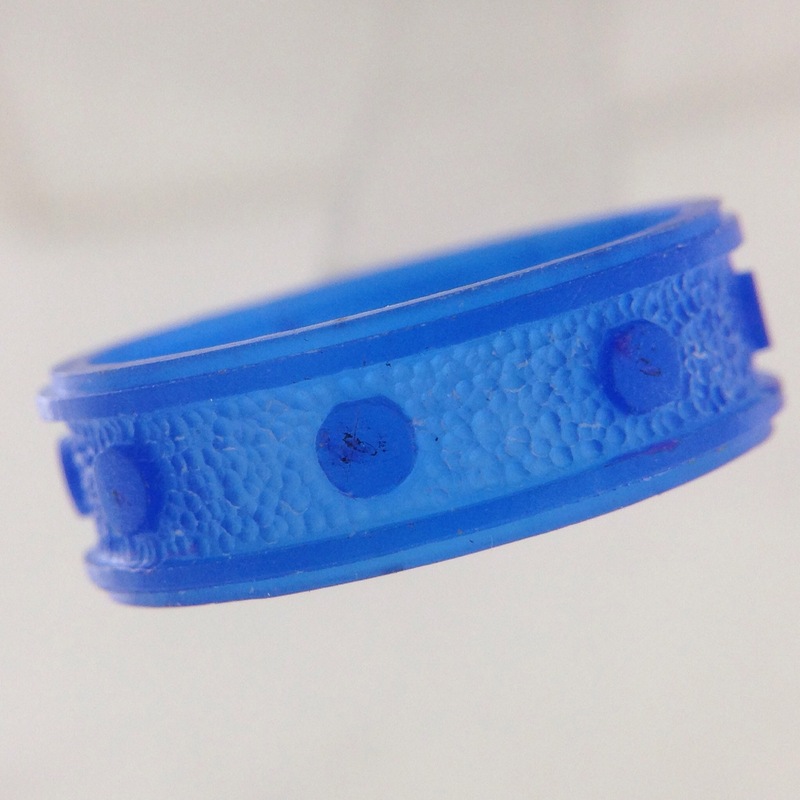 The button can be used in the next casting along with the addition of more new metal. I am working on the tension rods. 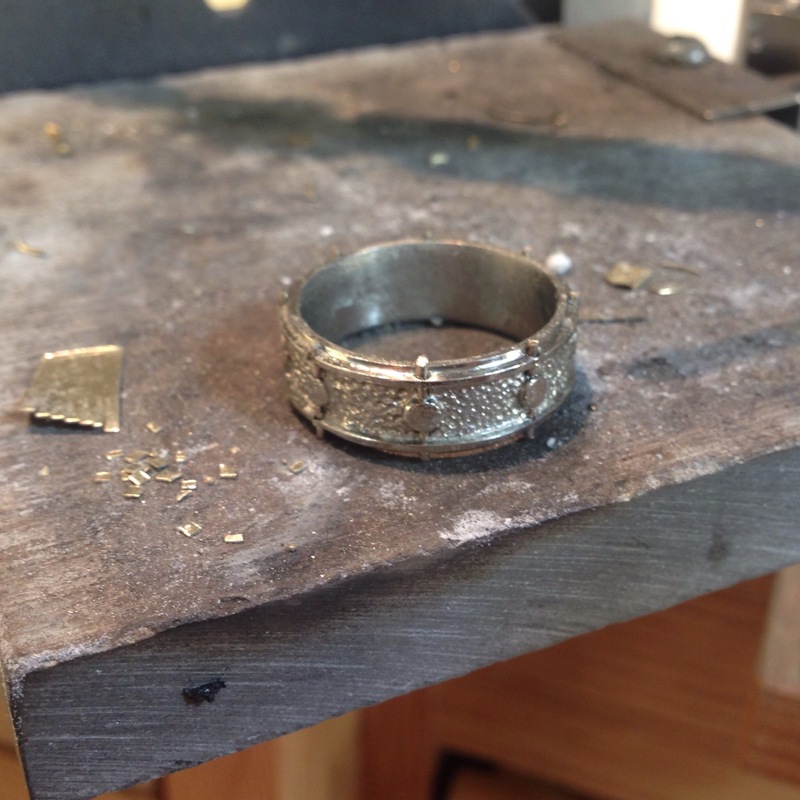 Holes are drilled and wire is soldered in place. 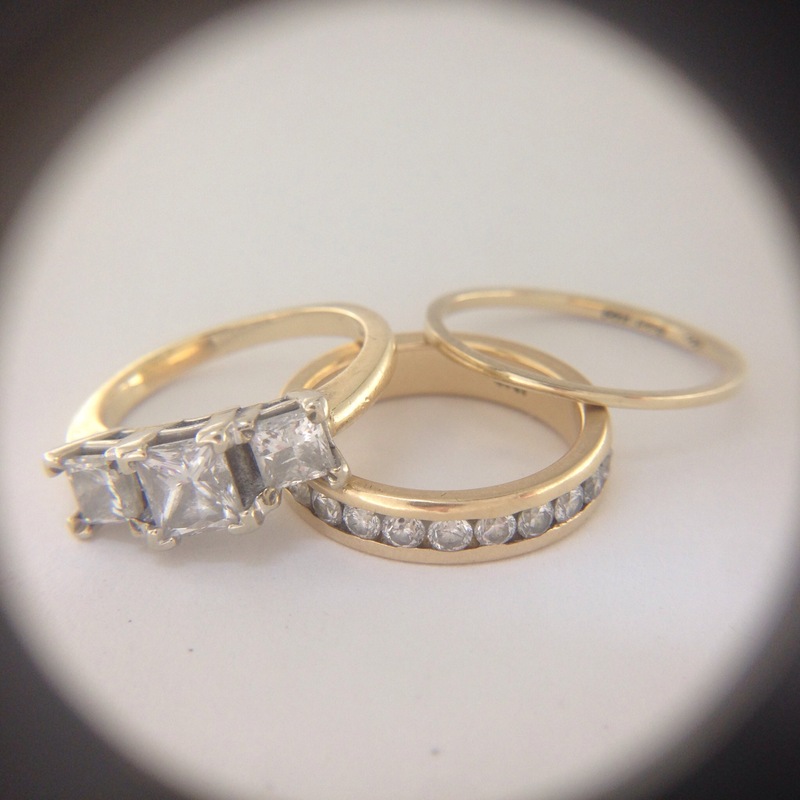 This series all began with my wedding band. 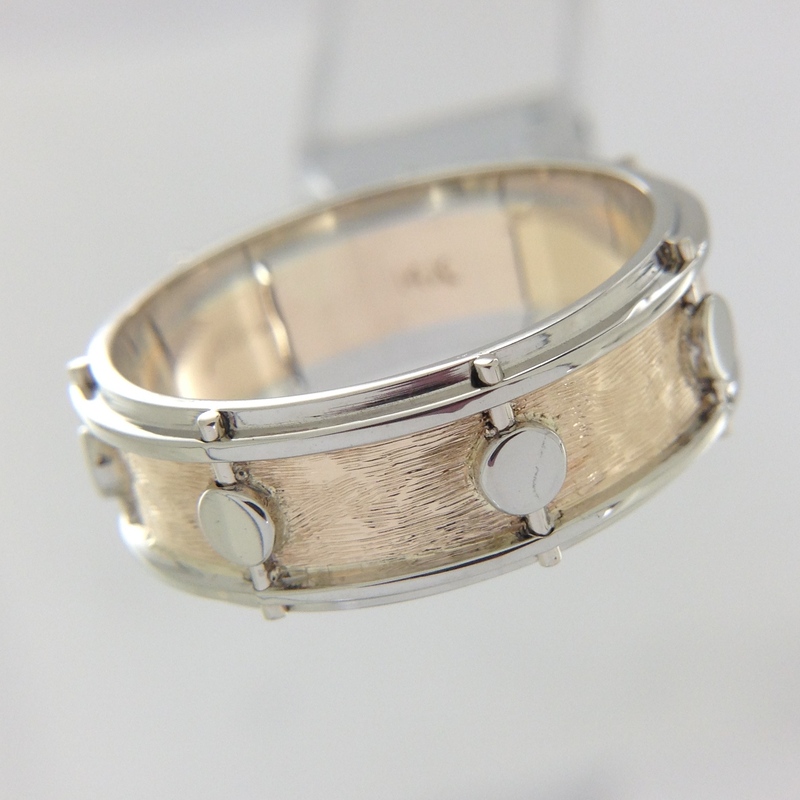 And I have done the same three band motif in a new and different way each time. 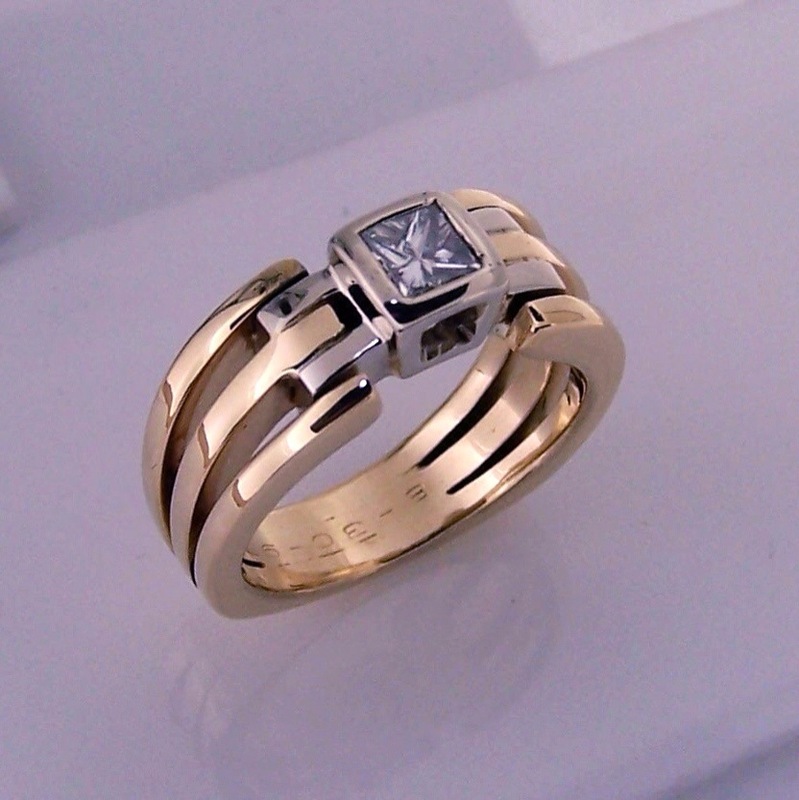 My ring (above) has a half carat princess cut diamond and is in 18k yellow and white golds. 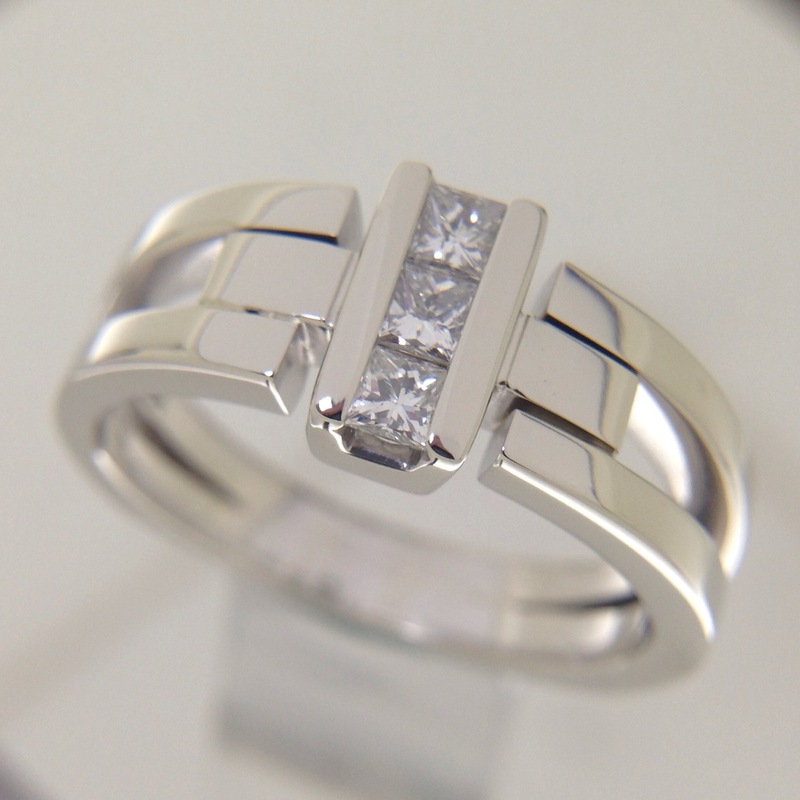 Square top wedding band version with three princess cut diamonds. 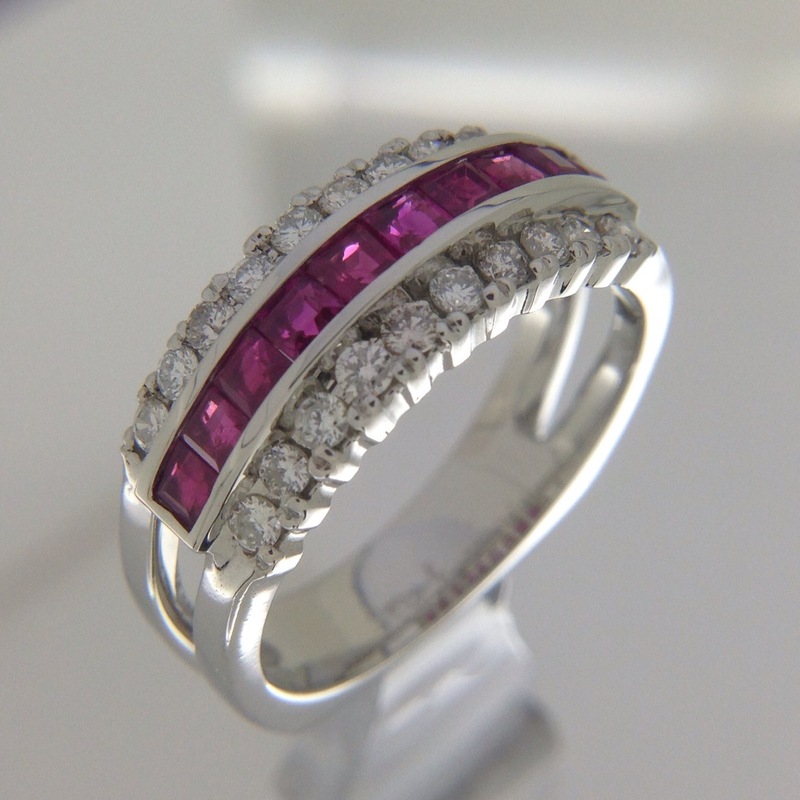 Two tone soft round band with round brilliant cut diamonds. Simplified to two bands. 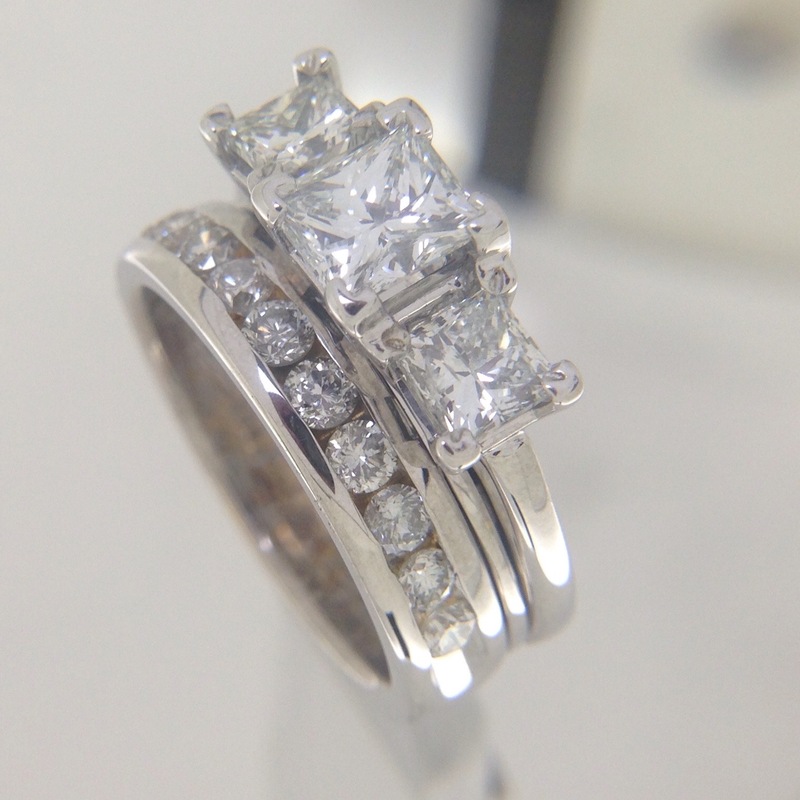 All 14k white with princess cut diamonds. 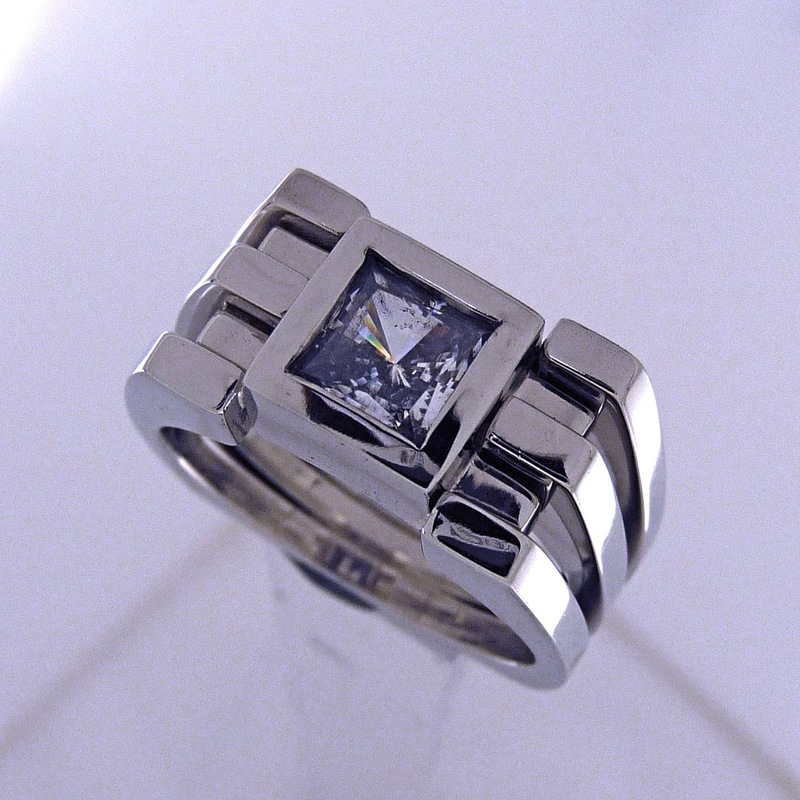 14k white gold, square top to go with the big square princess cut. 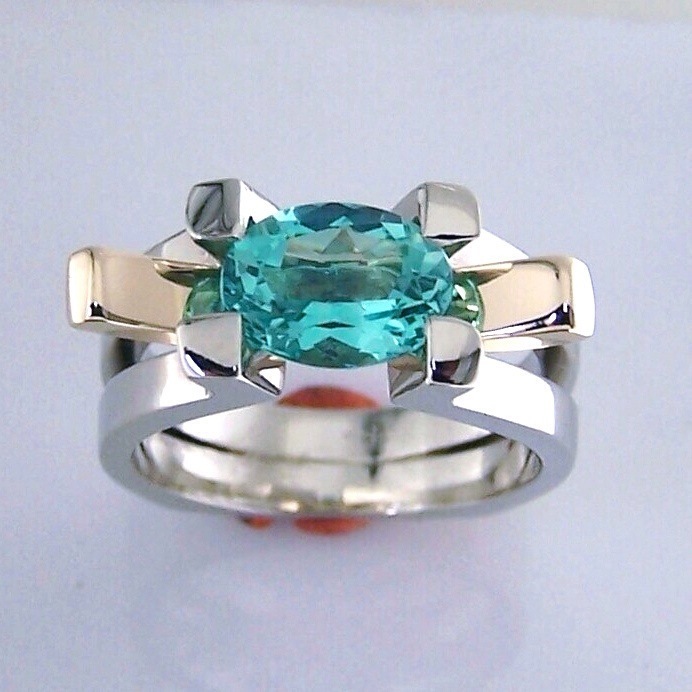 Non-wedding ring version using customer’s agate stone. 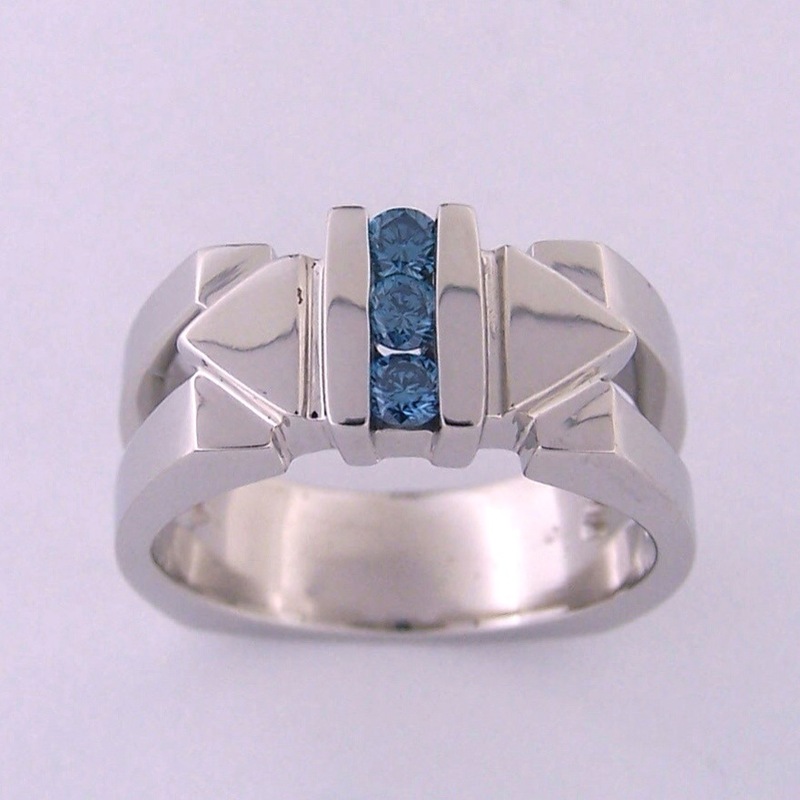 14k white gold always looks very striking with blue diamonds. 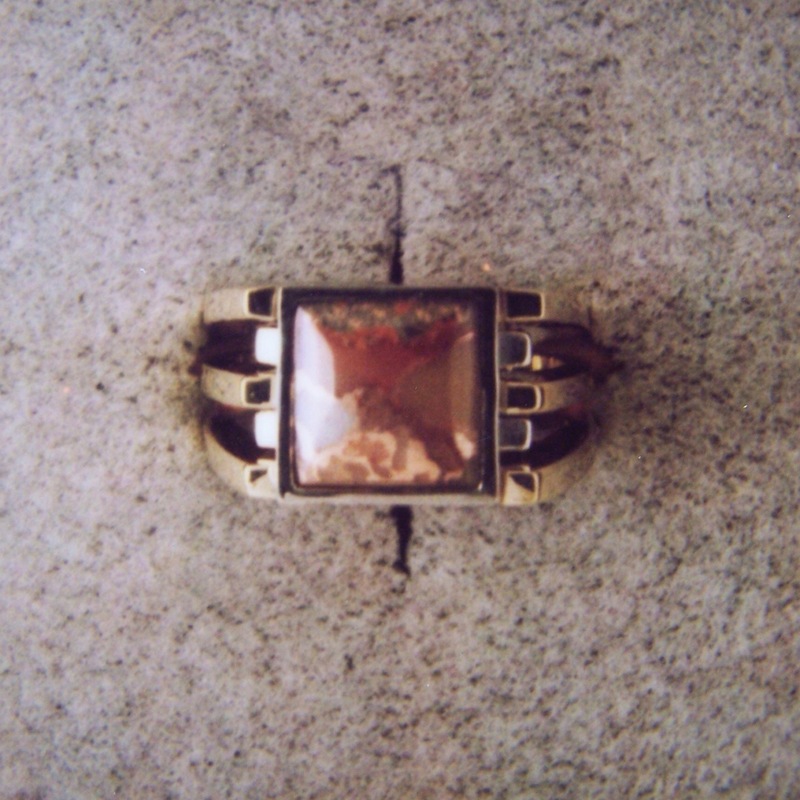 One of my favorite color stone, non-wedding rings was born from doing drawings for these rings.